Spring cleaning over here. As a family, it's amazing how much we can accumulate, and it's amazing how much I still have to downsize for this home even after almost four years here. But I have made a lot of progress these past few weeks with multiple trips to the Goodwill, and more to come. And as I work, I'm beginning to feel a touch of quiet peace or quiet sweetness in the air. 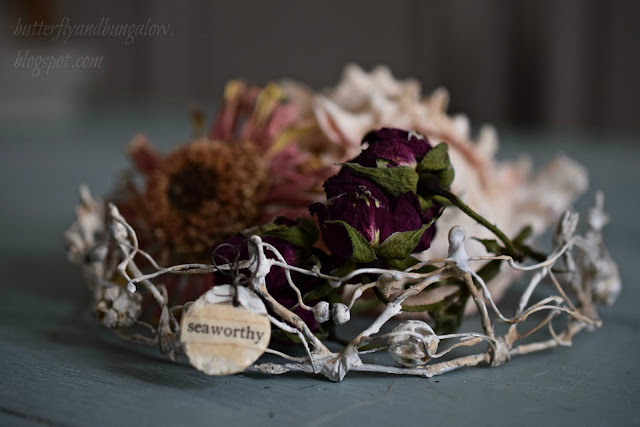 This beautiful brambling wire crown is from Dore's Burlapluxe Etsy shop, and I filled it with dried blooms and a seashell. 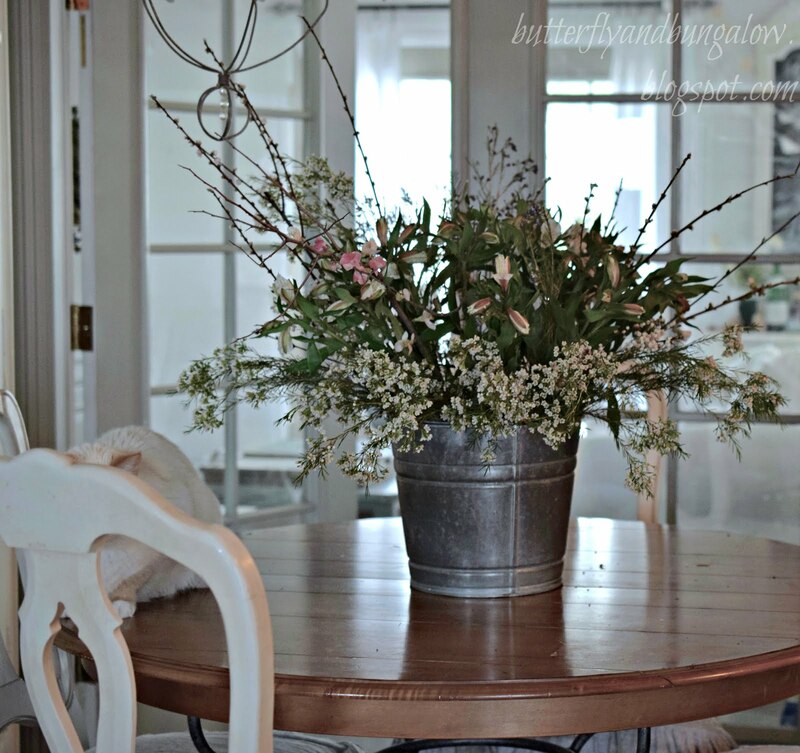 On the table there is a bouquet with an inexpensive bunch of fresh blooms, but the branches have managed to last from last week and even bloom. The arrangement I made has wax flowers, Peruvian lilies, and tree branches. Jack Jack the cat is there on the left, and he prefers not to take a photo, unlike Anya. When we are not looking, he is smelling the flowers. Over here, near the front entry, I added a dish of chocolate eggs. They look uncommon in a vintage pink pedestal dish. My spring mantel is here. I love the crown and who couldn't not resist chocolate Easter eggs in a pretty pink dish. Good for you on the Spring cleaning. Getting everything in its place before the dog days of summer. I have a feeling they're around the corner way to soon:(. I love your Easter decors. The crown is fantastic! 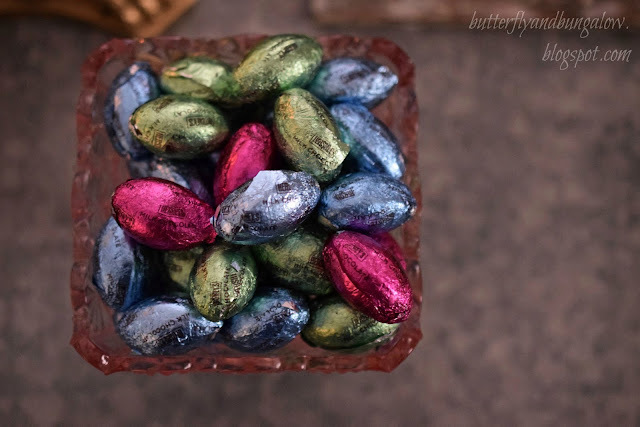 I see what I am missing: a batch of lovely foil covered Easter eggs! Your spring touches look great! I love the match of flowers, sea shell and the vintage crown! It makes an absolutely captivating décor. So pretty! You have me thinking it's time to pull out some spring decorations. Have a happy one, Su! So pretty Su. Doesn't have to be complicated to be beautiful. Love these accents. Love how uncomplicated and serene your look is Su! I love the simple serenity of your arrangements, Su. Your mantel is pretty, too. Us too - donating to Restore and Goodwill on our on going purge of the basement. Collected and stored over the years and now we ask why did we choose to hang onto items not displayed and long forgotten. So I'm right there with you with the Spring clean and fling, lol. 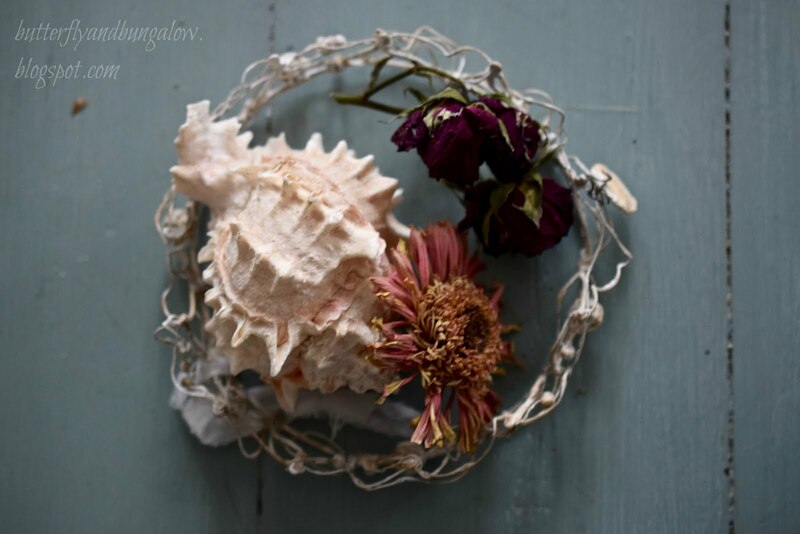 The crown looks pretty with the display of dried flowers and sea shell. Doré's crowns are so gorgeous and I too move mine around and display in different ways. I always admire your creative touchs in your home. Touches inspired with whimsy and delight. 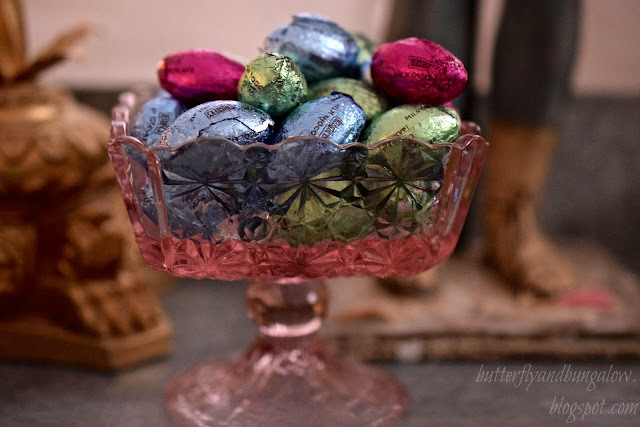 Love the square rose colored depression glass compote bowl. Looks so pretty for Spring and Ahhh the foil wrapped eggs. Thank you, Vera, so enjoyed the photo. Restore is great and so is Stardust. Do you have Stardust? That's Goodwill's version of Restore. Hi Su, no Stardust just traditional Goodwill stores in Philadelphia. Restore and Goodwill plus a local charity for kids are my favorites to donate to. I love the name Stardust. Su, I had been using Google comments for a long time. Then I disabled those and about a year-and-a-half with of comments has disappeared. I guess I'd better look into the whole Google "thing" if you had a hard time finding me. I'm not really sure how to remedy that. Thanks for letting me know!! 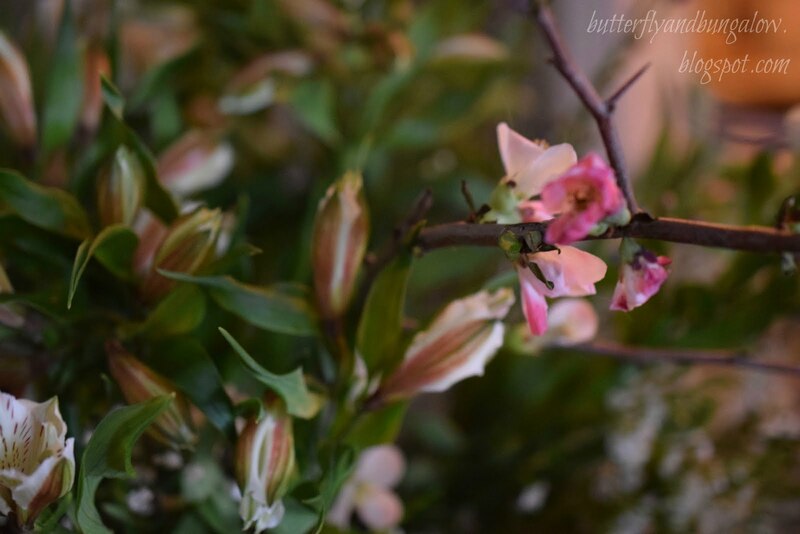 Aw....your little spring vignettes are so sweet and pretty! Did I miss something? Are y'all moving??? I see Jack hiding there - so cute! Maybe he is in his "shy" mode! I love these natural arrangements. Darling. So glad you shared and linked! They're not complicated at all, but so, so very beautiful and charming, my dearest Su, thank you for sharing them ! P.S. : I'm sorry I had to delete my previous comment, dearie, but I did such a mess, forgive me ! I adore your table centerpiece and the little touches of Spring that you put around your home. Aahhh...Spring cleaning...makes one feel good, doesn't it? 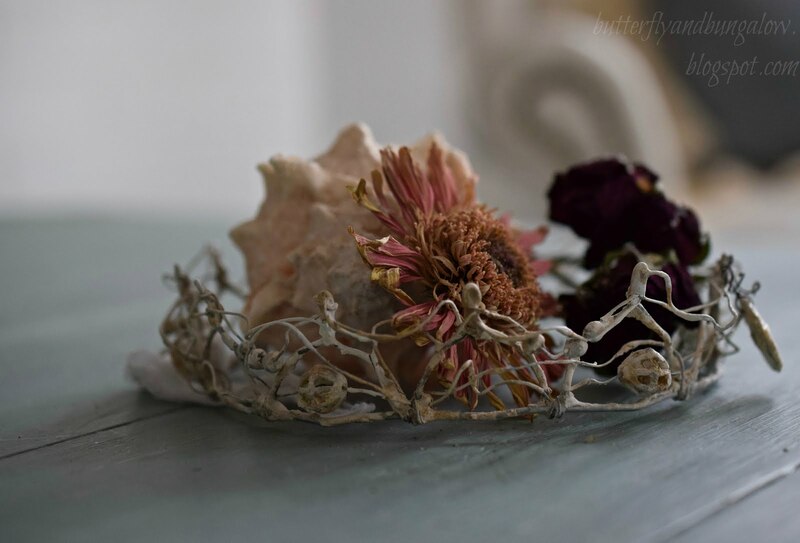 Those dried flowers and the seashells are perfect with the wire crown! Lovely, all, but the galvanized metal container is my favourite. We are in the process of moving to a smaller home with much more land. Although we've been able to decide to let go of quite a bit, there is still a whole lot we're keeping. I read your reply to the lady who asked if you were moving and can already see that scenario for us. We'll be starting by storing our stuff in huge hay shed, and then I fore-see much moving of boxes into other rooms, garage, shop, etc until I've finally decided on where to land things. You've done a wonderful job and things look serene and inviting in your home. after almost 3 yrs here (it will be 4 years next Oct) and I am still going thru boxes in the garage....just about to get it all done, tho, and I love having less stuff...makes me feel good. I too am cleaning out my house! It's amazing how much you accumulate! I really love that pretty floral arrangement. Lovely arrangements!!! I have been bringing in limbs of wisteria....it smells so wonderful! Beautiful signs of spring Su! Dore is so talented! Oh, it never ends! I went though a major declutter a few months ago and already it is creeping back in :-) But never mind, what lovely arrangements! My favorite is the first one, I love what you did with crown and Dore is amazing. Very lovely. Glad to see the spring touches. Hi Su, I like your casual way of spring decorating very much! To me it feels like not decorating to achieve perfection, but to appreciate the beauty of the little things in life that bring us joy. 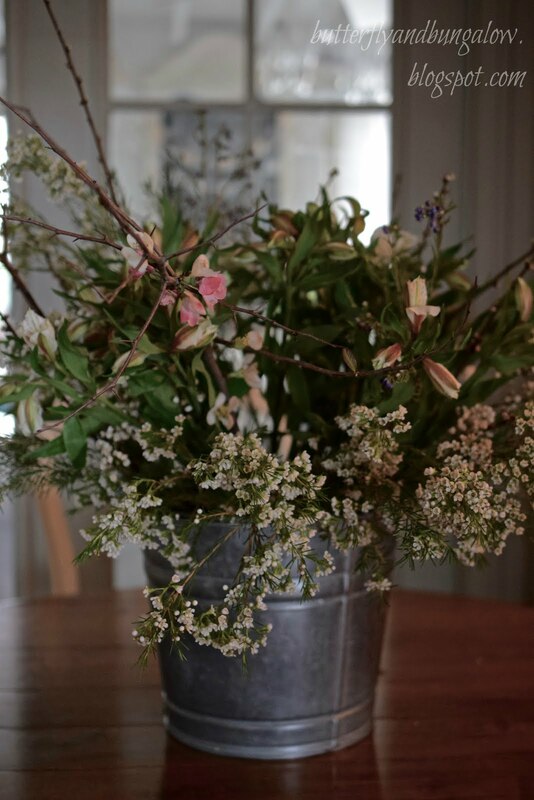 Love your spring bouquet and the Easter eggs in the vintage dish: So simple, so easy and so elegant! Well done! You have such a great eye. I adore your pink dish! The arrangements are all so stunning. You should link up this wonderful post at Thoughts of Home on Thursday. Have a wonderfully Happy St. Patrick's Day! These are the sweetest touches of spring! I like your simple flower collection in the bucket. And Dore's little crown frames your touches of nature beautifully. A very nice way to welcome the season! Thank you for joining Thoughts of Home on Thursday. Pretty pictures. I need to get some of those chocolate eggs a.s.a.p. I love the pink dish and chocolate eggs. THANKS so much for your comment telling me about Ikea...I am excited to go over to their site and check them out...we don't have a store here but there's one in Dallas...350 miles away....thanks again, sweet girl. Beautiful decorations...♥♥♥ the bucket of spring flowers and greenery. I love the flower arrangement on your table! Thanks for your sweet comment and for your answer about my dishes een Talabera, no they're not, they were made back at our Ceramic Co., hubby has for 30 years and sold it seven years ago. I had 14 different designs and I have four. I explain a little about them in the same post. Super stunning pictures. I am always surprised how much we accumulate too, really need to find some time to have a sort out.